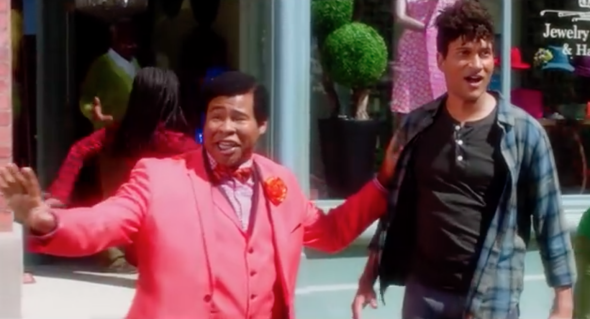 Key & Peele is the one show that knows how to make America's strained race relations funny. Key & Peele skillfully fuses some of the worst stereotypes about black Americans and their most positive modern media archetypes. Comedy Central’s Key & Peele returned for its fifth season on Wednesday night, and started out in familiar territory. There were anger translators, escalating duels, a hearty scoop of feminism, and footballers with crazy names. But one of the last sketches of the night was new and significantly darker. In it, Peele is dressed up as a trigger-happy white cop rapidly gunning down black men for offenses like holding popsicles and fuzzy giraffes. He eventually kills his own black police chief, an act for which he apologizes with a simple “my bad” before continuing his conversation. The sketch was simple, surprisingly frank, and tragically funny—and captured exactly why there’s no comedy show better suited to tackle our current political moment than Key & Peele. After the Charleston church massacre in June, many cable news anchors made laughable efforts to depict the shooting as about something other than race. “We’re still waiting for the exact motive in this case,” said Fox anchor Jenna Lee when shooter Dylann Roof had made clear to both his victims and his friends that he hated black people and had targeted a historically significant black church. CNN journalist Chris Cuomo seriously wondered on social media if maybe Roof was not actually white but disguised in whiteface, but decided it was best to “report what authorities say unless we know otherwise.” In a moment when a white woman with a perm and a tan can claim to be black and run the local NAACP, a blond Emma Stone can be Asian, and CNN apparently cannot discern between written Arabic and the silhouettes of various dildos at a gay pride parade, the line between justified outrage and meaningless noise is clearly whisper thin. Every day presents a new shocking, ridiculous, and confusing racial revelation—and ridiculous, shocking, and occasionally confusing is the exact comic mode in which Key and Peele work best. As a biracial duo doling out sweet-seeming sketches with a dark chocolatey center of critique, Key & Peele may be the only show today that knows how to make us really laugh at all of this. And now, in its fifth season, if sketches like “Trigger Happy Cop” and “Negrotown” are any indication, the show seems more willing than ever to wade into the so-ridiculous-it-would-be-funny-if-it-weren’t-tragic reality of our racial climate now. Much of what makes Key & Peele so sharp and relevant is its skillful fusion of the worst stereotypes about black Americans and their most positive modern media archetypes. The show implicitly asks the question, “What does white America want?” How does it like its black people? Singing and dancing? Loud and angry? Wise and magical? It then combines those assumptions in a way that is both incisive and subtly absurd. The creators generally succeed at making, as writer for the show Alex Ruben has put it, “relatively timeless comedy,” because these stereotypes aren’t new—they are just particularly hard to shake, even hundreds of years after they were first produced. Take Jordan Peele’s uncanny Obama impression from sketches like “Obama’s Anger Interpreter” and “Obama Raps.” The ideas are simple enough: contrast Obama’s cool, white-friendly demeanor with a more stereotypically black (i.e. : loud, angry, black vernacular-speaking) alter ego. The sketch combines two very different “types” of black people while conveying the real complexities of a being a black president, something that once seemed like a contradiction of terms. Another category of Key & Peele sketch finds comedy in the awkwardness of culture clash. “East/West College Bowl” is based on the simple premise that black footballers are heroes that millions admire, but also have often have some of the most preposterous names you’ll ever see announced on television (my real-life favorites are Boston College’s “Spiffy Evans” and Auburn’s “Gimel President”). Key and Peele are skilled at sending up the tension between the reverence with which white America treats its black role models and its failure to really understand them. In a similar vein, the sketch “Substitute Teacher” hilariously subverts this joke with a teacher who has no idea how to pronounce the names of the scared white kids in his class. When black Americans are forced to ask ourselves what white America wants, the way Key & Peele constantly, slyly insists that we do—to ask what will it take in the face of escalating violence to make black humanity undeniable—it seems in reality there is no answer, as “Negrotown” makes clear. Safety for black America is still an illusion, a technicolor fantasy. But watching Key & Peele, even those who hesitate to seriously discuss inequality for fear of wading into an increasingly fraught subject may be able to laugh at the ludicrous binaries it creates. By laughing at racial injustice, we can acknowledge its hypocrisy. The genius of Key and Peele is the way they have figured out how to open up that wound in a way that tickles instead of stings. And one of their most powerful sketches, the first released from this new season, “Negrotown,” contrasts police brutality and stereotypes about criminality with one of the most common depictions of black people on TV: the happy-go-lucky performer. In the sketch, a black man stopped without cause by the police is transported to a magical land where black people are free to exist without fear that a hoodie or a water gun might turn them into a hashtag. After Charleston, its message is all the more pointed; black churches have historically been a shelter and a rallying point for the black community—if not a kind of “Negrotown,” at least a safe space that once seemed unbreachable.